Marley Lilly + Jack Rogers! My two favorite things; monograms and Jack Rogers. Ahhhh, sounds like heaven to me. 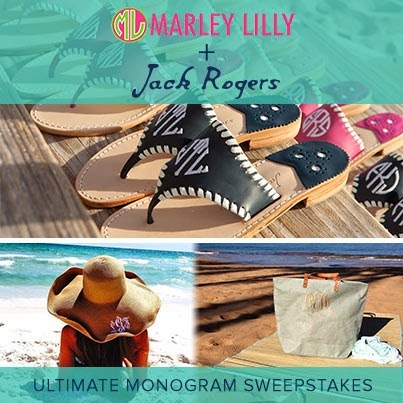 I've a always wanted a pair of the monogram Jacks, that's why when I heard that Jack Rogers and Marley Lilly were teaming up to give away a pair of monogrammed Jack Rogers (it doesn't stop there), a monogramed hat ,and tote bag, I may or may not have squealed. And that is the pure reason I knew I had to share this opportunity with you. You can enter to win until the 16th (this coming Wednesday) by going here! Make sure to enter before Wednesday! Ok, this post is perfection to me right now! I have literally spent all day researching Jack Rogers in preparation for acquiring my first pair ever! Somehow they have always been on my radar but I've never picked any up! I was about to get another pair of Torys and something finally clicked in my head and I thought "GET JACKS!!" Now I can't pick though, lol!